Sous-chef Chris Soffner in Natural Selection’s open kitchen. At a weekly menu meeting, Natural Selection owner-chef Aaron Woo volleys ideas back and forth with his sous-chef, Chris Soffner, in a rapid rally. They consider adding some brown butter flavor to a squash soup. “But how do we make it vegan?” asks Soffner. Woo, undaunted, comes up with a hazelnut pear butter. The pair then move on to discuss an Israeli couscous stained red with beet juice, gnocchi with dehydrated chard, and chanterelle agnolotti garnished with chocolate crumbles—all the while considering weather, produce availability, and the price of microgreens. In this tiny restaurant, Woo is serving vegetarian, vegan, and gluten-free meals so innovative that he is even entrancing enthusiastic meat eaters. The story of Natural Selection is in part a familiar one about seasonal cooking. Woo works closely with Oregon and southern Washington farms that deliver directly to the restaurant. But that farm-to-table connection is only the beginning. Woo, 43, is something of a jock—a guy who’s been known to follow up 14-hour days at the restaurant with late-night soccer games. That athleticism seems to inform his cooking: He expects all those carefully sourced veggies and fruits to perform. “I want them to do something different and adventurous,” he says. It’s relatively easy to make a big impression with, say, lobster, but it’s arguably more challenging to wow diners with something as prosaic as a carrot. Throughout the culinary world, though, vegetables seem to be displacing pork and foie gras as a proving ground for culinary magic. Call it a backlash to the “put some bacon on it” trend. But particularly in the West—the birthplace of hippie classics like the sprout and avocado sandwich, as well as California cuisine—chefs like Woo are embracing a new vegetarian wave, one that brings the intensive techniques of modernist cooking to the service of produce. Before launching Natural Selection, Woo cooked at the storied Clarklewis in Portland and opened what he calls “a comfort food vegetarian joint” called Vita Cafe, which he still owns. He is not a vegetarian (in fact, his dad is a butcher). But before debuting Natural Selection in March 2011, he spent several months on a strict diet to help treat a hyperthyroid condition called Graves’ disease. His experience with the limited vegetarian options—“I was so bored!” he says—left him with a desire to offer diners something more dynamic than seitan stir-fries. For inspiration, Woo launched out on an eating tour of Oregon and Northern California. On that trip, he had a mind- and career-altering meal at Napa Valley’s Ubuntu, one of the first vegetarian restaurants with a modernist bent. “There was no veal stock, gelatin, or braised meat, but still the richness was there through technique and thoughtfulness,” says Woo. He was so impressed that he gave up his veteran cook’s pride and interned, or “staged,” in Ubuntu’s kitchen for about a month, under chef Aaron London, who was then in his mid-20s. “I was the old dude doing intern work, schlepping everything around,” Woo says with a chuckle. Woo approaches every ingredient with a sense of adventure. He cooks down kale and onions, then dehydrates the mixture, powders it, and makes gnocchi. He roasts ramps and fava leaves into flavorful ashes. He dehydrates sauerkraut to make a “kraut dust” that adds a sour-umami touch to potatoes and other foods. And each night at Natural Selection, diners can glance over to the open kitchen and see Woo dusting, plating, pouring, and tweezing element after element onto their dishes with mellow precision. $$; 3033 N.E. Alberta St.; 503/288-5883. Though not all are strictly vegetarian, these restaurants around the West are moving the cuisine forward and wowing diners (even proud carnivores) in the process. Gather Restaurant, Berkeley. Executive chef Sean Baker spent years cooking with the groundbreaking vegan restaurant Millennium in San Francisco, so it’s no wonder he has a knack for meatless delights. Half his menu items are vegetarian, and few diners can resist the head-turning “vegan charcuterie,” a quartet of vegetable, fruit, and nut preparations. $$$; 2200 Oxford St.; 510/809-0400. Black Cat Farm Table Bistro, Boulder. At this bistro, copious produce from chef Eric Skokan’s 130-acre organic farm makes meatless meals easy to execute. There’s a vegetarian tasting menu every night, which could include courses like tomato and mushroom ragout with black garlic panisse or pumpkin seed risotto with carrot salad. $$$; 1964 13th St.; 303/444-5500. Hatfields, Los Angeles. Farm-fresh without the folksiness, Hatfields offers a nightly vegetarian prix fixe menu that might include a water­melon, avocado, and burrata salad, or a wild mushroom and buck­wheat crêpe. The four-course meal ends with a choice of co-owner Karen Hatfield’s standout desserts. $$$$; 6703 Melrose Ave.; 323/935-2977. N/Naka, Los Angeles. Chef Niki Nakayama ambitiously charts the seasons with her pristine Japanese-influenced fare. Every night a vegetarian menu is offered, enriched with produce and herbs from Nakayama’s own garden. Meat-free tweaks to tradition are witty, like a sashimi course made with Bull’s Blood beets. $$$$; 3455 S. Overland Ave.; 310/836-6252. The Painted Lady, Newberg, OR. 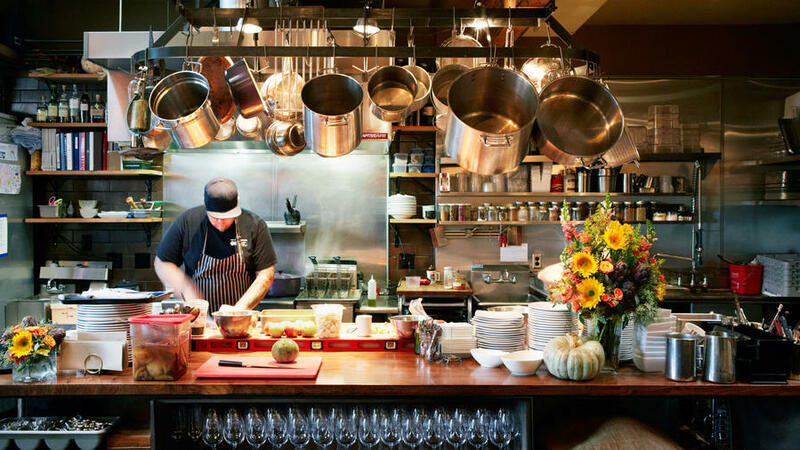 Ricotta agnolotti topped with a savory granola, and cardamom-scented crêpes filled with roasted vegetables: Luxurious Willamette Valley dining is indeed available for vegetarians at chef Allen Routt’s Oregon wine country retreat. The nightly vegetarian five-course tasting menu varies with the seasons; the local Pinot selection is abundant throughout the year. $$$$; 201 S. College St.; 503/538-3850. Encuentro, Oakland. Encuentro is a collaboration between Linda Braz and chef Lacey Sher, formerly of New Jersey’s Down to Earth restaurant. The result is a low-key wine bar with upscale rustic plates: kale salad layered with roasted butternut squash and pickled onions, and socca—a chickpea pancake—topped with something different each day. $; 200 Second St.; 510/832-9463. Commonwealth, San Francisco. Commonwealth chef Jason Fox casts a spell with his playful modern tasting menus. Each night he has one planned for vegetarians, with evocative offerings that might include a Douglas fir custard embellished with matsutake mushrooms, or pumpkin with walnut miso crispy kale and a quivering soft-cooked egg. $$; 2224 Mission St.; 415/355-1500. Poppy, Seattle. Chef Jerry Traunfeld’s urbane gathering spot specializes in thalis, an Indian-style approach of serving small dishes together as a complete meal. At least two platters are meatless every night, and diners can browse the likes of quinoa cakes with goat cheese, plum shiso pickles, and black cardamom glazed carrots. $$$; 622 Broadway E.; 206/324-1108. Sutra Restaurant, Seattle. Chef Colin Patterson’s five-course meals are part indulgence, part ritual—they famously all start with a solemn gong. The vegan menus change with the season. $$$$; 1605 N. 45th St.; 206/547-1348.